The legend of Bianca Andreescu keeps growing. The 18-year-old Canadian, fresh off stunning the tennis world by winning the title at Indian Wells, Calif., last weekend, pulled off an incredible comeback Thursday to win her first-round match at the Miami Open in Miami Gardens, Fla. Trailing 4-6, 1-5 to Irina-Camelia Begu, and then down match point with the Romanian serving at 5-2 in the second set, Andreescu recovered for a 4-6, 7-6 (2), 6-2 victory. A return winner saved the match point, and Andreescu broke serve that game, then held serve and broke again to level the set. The tiebreaker was one-sided, with Andreescu winning the first five points. Andreescu continued her resurgence in the final set, breaking serve in the opening game and cruising from there. "Well, it's a new tournament, new atmosphere, new environment, different court," Andreescu said, according to tennis.com. "I guess that took a bit of getting used to. Maybe I needed to almost lose to wake up. That's obviously what happened today. I'm really grateful how I managed." Andreescu, whose ranking rose from No. 60 in the world last week to No. 24 this week, moves on to a second-round matchup against 32nd-seeded American Sofia Kenin. "It still hasn't really soaked in, but now I'm getting more attention with the media, and a lot more people are asking for my autograph, watching my practices, watching my matches," Andreescu said. "So that's definitely changed. I guess it's slowly starting to sink in." 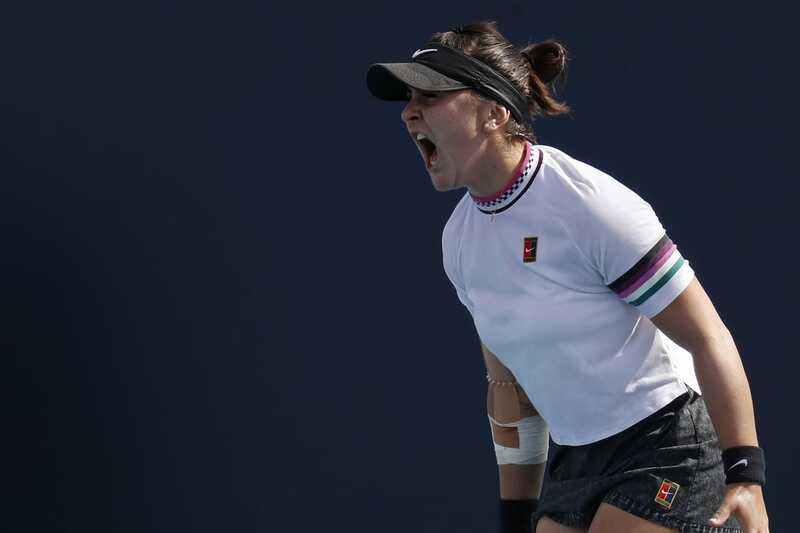 The Thursday result might be a good omen for Andreescu, as she beat Begu in the opening round at Indian Wells, also after dropping the first set. "I actually thought I was going to lose my first round (in Southern California), because I started off really, really slow," Andreescu said. "I was really nervous. I have never played at Indian Wells before on such a big stadium. I played on Stadium 2. I was pretty nervous. But I really didn't think I was going to win that match." In other first-round action Thursday, Venus Williams led a group of unseeded Americans who recorded victories. Williams topped Slovenia's Dalila Jakupovic 7-5, 6-3. Other American women to advance included Alison Riske, Cori Gauff, Whitney Osuigwe and Taylor Townsend. Third-seeded Petra Kvitova of the Czech Republic earned a second-round win, 6-1, 6-4 over Greece's Maria Sakkari, but 17th-seeded American Madison Keys lost 6-4, 4-6, 6-4 to Australia's Samantha Stosur. Also moving into the third round were seventh-seeded Kiki Bertens of the Netherlands, 15th-seeded Julia Goerges of Germany, 19th-seeded Caroline Garcia of France, 26th-seeded Donna Vekic of Croatia and 12th-seeded Australian Ashleigh Barty. The tournament's 32 seeded players, including top-seeded Naomi Osaka of Japan, second-seeded Simona Halep of Romania and fourth-seeded American Sloane Stephens, all received first-round byes.